Gunmen attack Ekweremadu’s home: The coalition of opposition political parties has raised the alarm over an alleged plan to kill some of its key leaders. The group said this while condemning the alleged assassination attempt on the Deputy President of the Senate, Senator Ike Ekweremadu. Ekweremadu, at the plenary on Tuesday, narrated how armed men broke into his house in what he alleged to be a failed assassination attempt. The Senate, which condemned the development, mandated the Committee on Police Affairs to probe the attack. Ekweremadu said, “It is with gratitude to Almighty God that I will like to tell my colleagues, my constituents and the general public that myself, my wife and my son narrowly escaped assassination in the early hours of this morning. It was about 4am that some people evaded the security in my house and got all the way to my room where I was sleeping with my wife. “I don’t intend to give details as the police are on this matter. But there was a struggle, there was a fight, and there was a heavy commotion. By the grace of God, we eventually caught one of them and the rest escaped. We were able to hand over that one to the police, who are now investigating the matter. 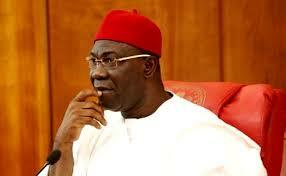 Ekweremadu lamented that Nigerians were no longer safe, even in the Federal Capital Territory, Abuja. President of the Senate, Bukola Saraki, described Ekweremadu’s experience as “terrific and unfortunate”. Saraki said, “As you said, it is under investigation. But it is unfortunate the security situation in Abuja. More disturbing is the poor response by the police. I hope that the police are not being partisan in the way they treat cases of such. The Senate President added that the legislature would continue to do its best to address the security situation in Nigeria. In its reaction, the Coalition of United political parties said the lives of key opposition leaders were no longer safe. The CUPP, which is a coalition of more than 40 opposition political parties, said in a statement by its spokesman, Mr Ikenga Ugochinyere, condemned the invasion of the deputy president’s home. He said, “The CUPP condemn today’s early morning failed assassination of the Deputy Senate President, whose house was invaded by heavily armed men while still asleep with his son and wife. “This shocking armed raid is a sad development and a danger signal that homes and lives of key opposition leaders are no longer safe. The Peoples Democratic Party also expressed concerns over the incident. National Publicity Secretary of the party, Mr. Kola Ologbondiyan, in a statement, called for an immediate probe of the attack. The police said they have arrested two suspected burglars who broke into the residence of Deputy Senate President, Senator Ike Ekweremadu, at Apo legislative quarters, Abuja, on Tuesday. Mohammed Yusuf of Kauranamuda, Zamfara State, was arrested along with one Ali who escaped from the scene around 4.30 am. The police spokesman, Moshood Jimoh, said in a statement that Yusuf had confessed to the crime. He denied that the incident was an assassination attempt on Ekweremadu, adding that only a motor jack, big screwdriver, a big rod, small kitchen and other housebreaking implements were recovered from the suspects. Jimoh said, “Preliminary investigation carried out so far did not reveal an assassination attempt on the life of the Deputy Senate President, Senator Ike Ekweremadu, and his family but a case of burglary.